This was an interesting commission. The whole concept revolves around one element: the bride's Engagement Pendant. Isn't that a cool idea? The bride is a paediatrician and can't wear rings on her job, so her fiancé instead commissioned a custom pendant from a jeweller. This struck me as incredibly romantic! The groom wanted the Engagement Pendant to feature heavily one way or another throughout their wedding stationery, and when time came to commission a ketubah, he approached me to create a design that would pay homage to it. At first he wasn't sure if he wanted the pendant to be center stage or nestled among the other elements, so I prepared two previews. I don't do that usually, but I was curious which I myself would prefer. After seeing both design drawings he opted for the latter choice. 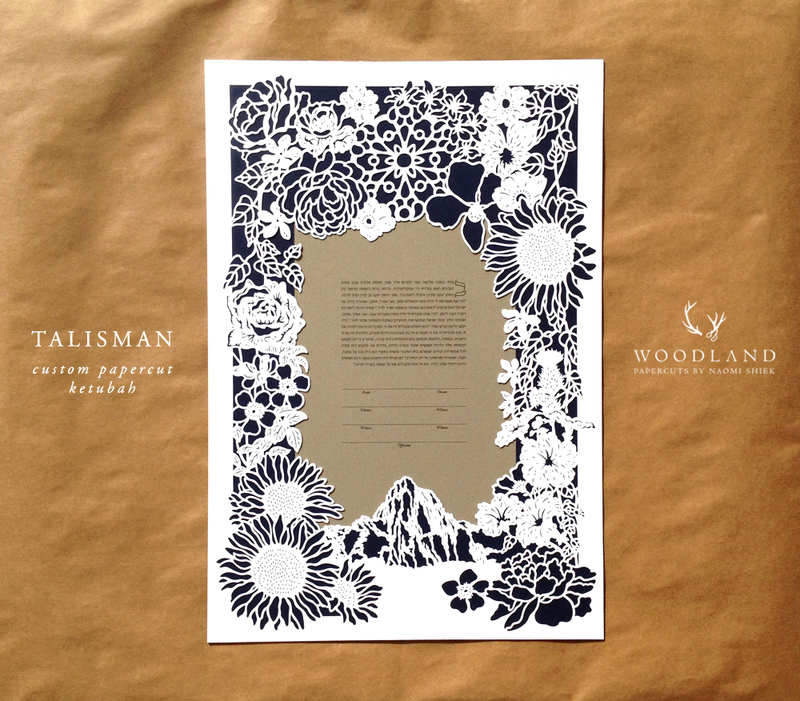 Mayflowers and anemones to symbolise the Bride's home State and Israeli roots, sunflowers to symbolise the Groom's home state and the Bride's love of sun art, and the Sierra Nevada mountains where their love blossomed - are all included in the design. We chose Midnight Blue and Gold Leaf papers for dramatic effect, and the end result is pretty spectacular!